Relief agencies like the American Red Cross say monetary donations give them the greatest flexibility to address victims' needs. 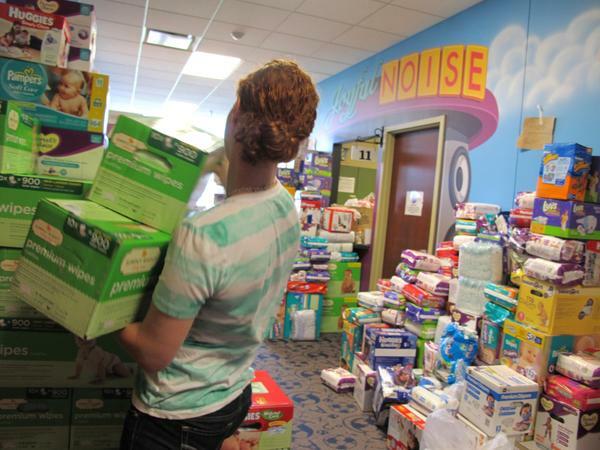 JourneyChurch in Norman, Okla., is packed with donations, including a wall of diapers. The tornado that devastated much of Moore, Okla., has drawn loads of donations from across the country: food, clothing, medical supplies, toys. Much of it is needed by the victims, but not everything. After every disaster, relief groups usually ask for one thing: money. But writing a check or texting a donation isn't always that satisfying for those who want so desperately to help. "And there's your obligatory giant rack of ramen noodles," Taylor says. In fact, this church has accumulated so many items that volunteers are busy building a tent in the parking lot to store some of the stuff so there is room inside to hold church services this weekend. Taylor says he believes people have an innate need to serve. "So many people ... just feel this urgency like, 'I gotta do something,' " he says. Trucks and volunteers have been streaming in all week long, from Texas, California, Tennessee, even Joplin, Mo., where people know a thing or two about how to organize chaotic relief efforts. Sean Hawkins and seven others traveled from Phoenix with three trucks loaded with cases of water, Gatorade, shampoo, soap, clothing and work gloves. How did they know what to bring? Hawkins says they didn't, really: "We just figured we'd put ourselves in the grace of God and said, 'If we were without, what would we need?' "
But donations have been so overwhelming that groups around town are posting on their websites, "Please, no more clothes." The city of Moore suggests that those who want to give should send money to the American Red Cross, the Salvation Army or a local food bank. Monetary donations have been strong. 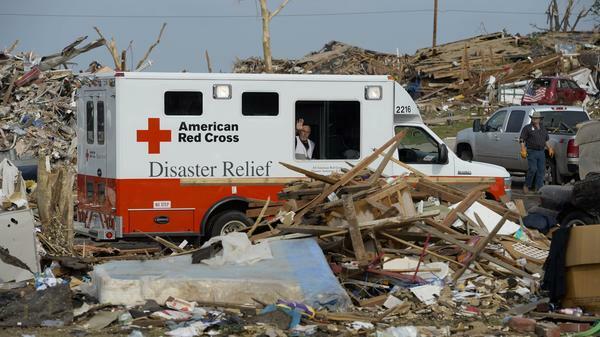 The Red Cross raised $15 million as of Thursday night for its efforts here. The Salvation Army raised more than $3 million. These groups say money is flexible; they can buy what victims need the most at any given moment. But JourneyChurch member Erin Cosby says sometimes it's hard to wait, like when they got a desperate plea from the Heatherwood neighborhood in eastern Moore. "They were not gotten to before yesterday morning, they were there by themselves," she says. "There [were] 200 adults, it was 25 children, and nobody had found them yet. Somebody through Facebook contacted us and said these people need food and water — that is all that they have asked for." Indeed, the need is great in Heatherwood. Dozens of homes have been shredded like paper. But the neighborhood hardly looks forgotten anymore. Women in a pickup truck offer free cleaning supplies. Volunteers in a Red Cross mobile van hand out hot meals to residents and work crews. Nearby, resident Lila Thompson helps distribute supplies just delivered to a street corner by JourneyChurch. "All the ready-meal packs, the water that's here, the diapers and the wipes and the paper towels and the toilet paper and just all the daily supplies," she says. People here say, so far, they've gotten everything they need. It's what they'll get in the weeks and months ahead that are the big unknowns.  This is WEEKEND EDITION from NPR News. I'm Scott Simon. And it's now been five days since a huge tornado tore a 20-mile path of destruction through parts of Oklahoma. A tornado devastated much of the city of Moore, where it killed at least 24 people and injured many hundreds more. This week, truckloads of donations arrived in Moore from across the country - food, clothing, medical supplies, children's toys - some of it useful but not all. As NPR's Pam Fessler reports, managing donations in a disaster is a challenge of its own. PAM FESSLER, BYLINE: After every disaster, relief groups usually ask for one thing: money. But writing a check or texting a donation isn't always that satisfying for those who want so desperately to help. MARTY TAYLOR: There's diapers everywhere - more diapers in there; more diapers in here, an entire wall of wipes. FESSLER: Marty Taylor is a pastor at the evangelical Journey Church in Norman, just south of Moore. This megachurch has become a kind of mega-relief center. Hundreds of volunteers sort thorough rooms packed with donations, everything from diapers and teddy bears to crutches and toilet paper. TAYLOR: And there's your obligatory giant rack of ramen noodles. FESSLER: In fact, this church has accumulated so many items volunteers are busy building a mega-tent in the parking lot to store some of the stuff so they have room inside to hold church services this weekend. Taylor believes that people have an innate need to serve. TAYLOR: Where so many people are like just feel this urgency like I got to do something. UNIDENTIFIED MAN #1: OK. You want tacos as well? You want a little more? UNIDENTIFIED MAN #2: Yeah, yeah. (unintelligible). FESSLER: Trucks and volunteers have been streaming in here all week long from Texas, California, Tennessee, even Joplin, Missouri, where people know a thing or two about how to organize chaotic relief efforts. They brought clipboards, among other things. Sean Hawkins and seven others traveled from Phoenix with three trucks, loaded with cases of water, Gatorade, shampoo, soap, clothing and work gloves. I asked him how they knew what to bring. SEAN HAWKINS: We didn't. We just figured we'd put ourselves in the grace of God and said if we were without, what would we need? FESSLER: But donations have been so overwhelming that groups around town are posting on their websites: Please, no more clothes. The city of Moore suggests that those who want to give should send money to the American Red Cross, the Salvation Army or a local food bank. And monetary donations have been strong. The Red Cross raised $15 million as of Thursday night for its efforts here. The Salvation Army raised more than $3 million. These groups say money is flexible - they can buy what victims need the most at any given moment. But Journey Church member Erin Cosby says it's hard to wait, like when they got a desperate plea from the Heatherwood neighborhood in eastern Moore. ERIN CROSBY: They were not gotten to before yesterday morning. They were there by themselves. It was 200 adults, it was 25 children, and nobody had found them yet. Somebody through Facebook contacted us and said these people need food and water. That is all that they have asked for. UNIDENTIFIED WOMAN: You guys need trash bags? FESSLER: And indeed, in Heatherwood, the need is great. Dozens of homes have been shredded like paper. But the neighborhood hardly looks forgotten anymore. Women in a pickup truck offer free cleaning supplies. Volunteers in a Red Cross mobile van hand out hot meals to residents and work crews. Nearby, resident Lila Thompson helps distribute supplies just delivered to a street corner by Journey Church. LILA THOMPSON: All the ready-meal packs, the water that's here, the diapers and the wipes and the paper towels and the toilet paper and just all the daily supplies. And I need to eat. I'm sorry. I really need to eat, so. FESSLER: She picks up a Styrofoam container filled with beans and barbecue. People here say, so far, they've gotten everything they need. It's what they'll get in the weeks and months ahead that are the big unknowns. Pam Fessler, NPR News, Oklahoma City. Transcript provided by NPR, Copyright NPR.